I finally got the chance to go to mass today. Thank God, the cab driver agreed driving for me in this short distance. If only the weather is not negative Celsius, I could have walked myself. But as weeks passed by, it didn’t happen so I decided to find other ways of getting to St. Hubert Catholic Community. The mass was scheduled at 10:30 am and I arrived 30 minutes earlier. 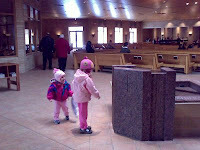 Upon entering the place, I was expecting to see the Altar first. But instead , what I first saw was the lobby with some people waiting there, then at the rigth side was a break room with free coffee and donuts courtesy of the sponsor for the week. (I almost thought I was not at the right place. I didn’t really expect the place to be that way, and to be so beautiful). So I kept on walking to find the Altar, then I saw the coat room intended for the winter coats and jackets of church goers. Further to the left side was an indoor basketball gym. 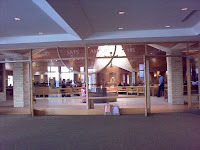 Then finally, the Altar, which was at the right side before the gym. There were 2 presiding priests during the mass. The ceremony was almost exactly the same in the Philippines, except for some prolong kneeling everytime the Holy Host was raised and after the Communion. Experiencing the place, I couldn’t help myself wishing to have this kind of place for worship in the Philippines…but I know that what is more important is to make our hearts prepared to worship Him.